Happiness is life served up with a scoop of acceptance, a topping of tolerance and sprinkles of hope, although chocolate sprinkles also work. In many places fall is in the air, crisp temperatures, greys skies are beating back the smaller pockets of blue, sunny skies. Yes, folks for some unfortunate but summer is in full retreat and fall has taken its rightful place. But there's a way to beat back those chills with an inviting dessert. It's with that in mind that I bring you a little treat, that will compliment a cool, crisp fall evening. This a great dessert, that gives great depths of flavor and boat loads of smiles to guests who may be visiting. The Yalumba Museum Reserve Muscat from Barossa Valley, which I picked last weekend because we were having guests and we planned on smoking a few gar's after the dessert. Which got me to thinking; "hmmm what wine would pair nicely with a chocolate themed dessert and a fat-Cuban cigar? Good questions and I think that I came up with a few answers to the age-old wine question, "what to pair" with my suggestions below. 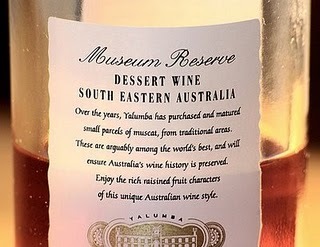 It was a bit of a quandary for just a moment, until I came across, Yalumba Museum Reserve Muscat and I thought oh-yeah here we go. A amber-colored, infused with brandy-spirits, brimming with rich complex flavors of roasted nuts, orange peel, toffee and dried fruits [think raisins and figs] and just a touch of lemony brilliance and just enough acidity to offset the sweetness, leaving you with a long persistent finish. Lucky for me an old friend of Mrs. Cuvee and I was gracious enough to part with a few "Cubans" from his recent trip to Havana. We ended up putting away a few hand-rolled cigars, Romeo Y Julieta 2 (Churchill) and wow it was a thing of beauty. Everyone who gave it a go, loved how smooth and yet full-bodied with rich complex flavors like the delicious tawny style Muscat which accompanied it. I compare this style of late harvest to a Tawny Port, as it’s very similar in taste and style, some would even say it compares favorably to a Fonsesa 20 year old Tawny, but without the huge $40.00 price of admission. All said and done, it was a great evening and the cigars, Muscat and the dessert were great partners in punctuating the evening. Here's to great friends, great food and great memories. Below you will find the recipe, which is super simple to prepare and it turned better than expected. Until next time sip long and prosper, cheers! 1. Place 1/4 cup Nutella in the corner of a small sandwich ziplock bag. Cut off the tip and, on parchment paper, carefully squeeze out 16 to 18 small balls of Nutella. Place in freezer for at least one hour. 2. While Nutella centers freeze, put 3.5 oz milk chocolate chips, white morsels, rest of Nutella and espresso powder in a medium size bowl. Heat heavy cream in sauce pan over medium-high until it begins to foam. Remove and pour 1/2 over mix in bowl. Allow to set for 45 seconds. Carefully stir well. Pour remaining in and mix until completely blended. Put bowl in refrigerator for 30 minutes. 3. Remove bowl from refrigerator. Using a hand mixer on low speed, carefully mix chocolate + cream mix until it's a light and fluffy ganache. Put back in refrigerator for at least 30 minutes. 4. 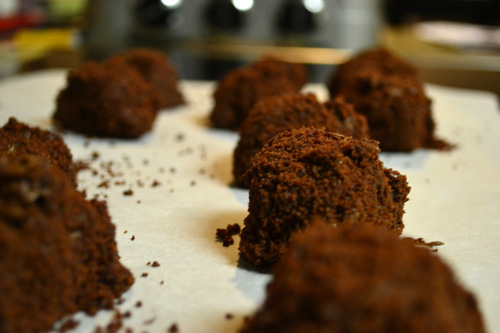 Using two spoons, quickly roll Nutella centers in ganache, forming round tablespoon-sized balls. Place on parchment paper and refrigerate for at least 30 more minutes. 5. Place Madeleines in the food processor and blend until evenly crushed. 6. Put remaining 8 oz chocolate chips in microwave safe bowl. Microwave on high for 20 seconds, remove and stir. Continue this process until just melted. 7. The final step; working in batches, quickly remove 3 or 4 balls from the refrigerator. Using two small spoons, roll centers in melted chocolate, then roll in crushed cookies. Place on parchment paper. Continue until all truffles are completed. Serve immediately or place in refrigerator until ready to serve.